The Throwback: Remember Nickelodeon's 'Hey Dude'? Nickelodeon's "Hey Dude" is being released on DVD next week by SHOUT! Factory. Filmed in Tucson, Arizona from 1989-1991 but set during one summer at the fictional Bar None Ranch, the children’s sitcom chronicled the adventures of teenagers who taught riding lessons and took care of guests. Mr. Ernst, the only adult major cast member, was a former New York City accountant who purchased the ranch on a lark. Actor David Brisbin's portrayal of Mr. Ernst provided comic relief of the fish-out-of-water sort. "Hey Dude" was also Nickelodeon's first original live-action series, and paved the way for favorites like "Clarissa Explains it All" and "Salute Your Shorts." Admittedly, "Hey Dude" had sort of a niche audience. Either you know what it means to "watch out for those man-eating jackrabbits and that killer cacti," or you're hard-pressed to figure out why we're committing bandwidth to something so obscure. Not only were "Hey Dude" viewers roughly 8-14 (so over the span of the series, they would've been born between 1975 and 1983, give or take), but they also would've had cable – or a friend who had cable – to watch Nickelodeon, which wasn't as common. So when I told people that I was writing this week's "Throwback" on "Hey Dude," their reactions ranged from "Huh?" to "Ooh! I LOVED that show!!!!" to "Are you sure you're not talking about 'City Slickers?'" But the mention of "City Slickers" made me realize something I'd never connected the dots on before: In hindsight, it is crystal clear that America went through a major wild west/ranch obsession in the late 1980s/early 1990s. Did "Hey Dude" help "rope" in this national obsession? Perhaps. Think about it: The Escape Club's song "Wild Wild West" was wildly popular throughout most of 1989. Who could forget the gunshot sound effects, or those lyrics: "Headin' for the '90s, livin' in the wild, wild west." Then "Back to the Future, Part III" came out in 1990. Where did most of it take place? The Old West. The following year gave us the children's animated feature film "Fievel Goes West" (the sequel to "An American Tail") and Garth Brooks' album, "Ropin' the Wind." And of course, we had the aforementioned "City Slickers" that same year. Then in 1992, "Unforgiven," a Western, won four Academy Awards. Maybe Clint Eastwood can thank "Hey Dude" for that Oscar. I’m convinced that the reason the 1999 Will Smith/Kevin Kline (wagon) train wreck "Wild Wild West" fared so poorly was because it wasn’t released during America’s love affair with all things tumbleweed and spurs. 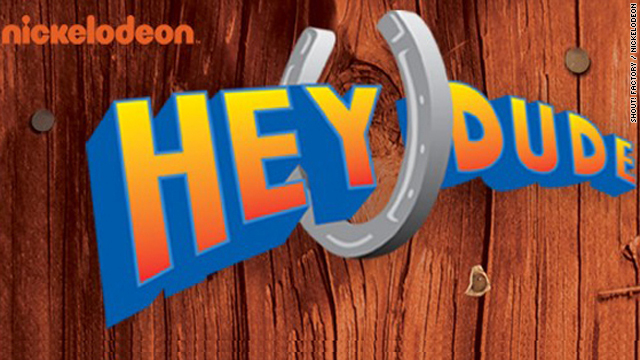 But the real question is: Will the DVD release of "Hey Dude" rekindle America's cowboy craze? The weight is on your shoulders, "Cowboys & Aliens." Wow, Fantastic Blog, it’s so helpful to me, and your blog is very good,I’ve learned a lot from your blog here, Keep on going, my friend, I will keep an eye on it. Health is most precious thing in the world we all know this fact very well. So we need to keep healthy and maintain our body. For this we need to take such supplement they fulfill all need of our body. For more details visit to our website given below. My brother suggested I might like this website. He was entirely right. This put up truly made my day. You cann't consider simply how much time I had spent for this information! Thanks! Would you like to Earn R7 000.00+ part-time or R15 000.00+ full-time working from home? Hello, I enjoy your weblog. Is there something I can do to receive updates like a subscription or something? I'm sorry I am not familiar with RSS? This show absolutely rocked! You were either a Hey Dude fan or a Saved by the Bell fan. Those in the Hey Dude camp knew quality television...Too bad for those only exposed to crap like SBTB, when the best kids programming was over at Nick. YES! Thank you! I'm so glad someone remembered this show and reminded us all how amazingly awesome 90s Nickelodeon was. Have you heard Teen Nick was going to do a 90s throwback this month? I haven't heard anything more than that. Please write an article on it! 🙂 And for the record, I watched Hey Dude and was born in '86. Is Mr. Ernst the "master of his domain?" Dave Brisbin (Mr Ernst) married to Laura Innes ("The ER, The Event) can be seen in "Leaving Las Vegas", Erin Brockovich", "Desperate Housewives"(the doc who tells Susan she needs a kidney). He's doing well. I loved Hey Dude and I was born in '86. I guess I caught the reruns? I loved Hey Dude. I thought Ted was cute. I also loved Pete and Pete and You Can't Do That on Television. Nick doesn't have that kind of comedy anymore. I have watched the channel with my nieces and nephews, and there is just cartoons on that rely heavily on the gross-out factor. I've already pre-ordered it on Amazon. My absolute favorite 1990s Nickelodeon show. Hey Duuuuuuude! I was born in 1989, and in high school when we were reminiscing in physics (which happened more than once, it was a boring class) Hey Dude would always come up. Even though it was only on, what, three seasons, Nickelodeon had it on pretty heavy syndication, so those of us a few years down the road are familiar with it, too. And now that you mention Christine Taylor was on it reminds me why I recognized her in The Brady Bunch Movie. I remember it, but it wasn't nearly as good as Clarissa Explains It All and my absolute favorite Salute Your Shorts. Hey Dude was awesome! i loved this show when i was a kid and im only 25. must have been reruns but it was great! salute your shorts as well!! pete and pete!!! old nick shows were the best and i miss them fiercely. guess im going to have to invest in the box sets as they come out!! Born in 83, totally remember this show....good times! Rocco's Modern Life, Roundhouse, Ren and Stimpy; brings me back to my childhood. There also used be some Canadian show (the kids had canadian accents anyway) about two friends and one was named Izzy.....anyone remember this show? I remember this show, and there were two reasons I watched it; Melody and Bradley. When I was a kid I thought it would rock to have a summer job like the one they all had. I've always been a fan of Hey Dude! So glad to see this DVD coming out! I was actually a huge fan of all those old Nick shows! Thanks for writing about this, glad to know there are other geeks like me. I don't rememb er anything about this show but I know all the words to the song. I loved this show along with "You Can't Do That on Television," "Fifteen," "Salute Your Shorts," "Clarissa Explains It All" and so many others! Pete & Pete as well as Clarissa are available on DVD – check Amazon. Anyone remember "The Secret Life of Alex Mack?" Loved that one, too. Thanks for the trip down memory lane, CNN! I loved the Secret Life of Alex Mac too!! It was one of the best shows. Now I can understand you morons a little better and it's all becuse of Hey Dude. Show was OK, but I hated having live action stuff on Nickelodeon (except for "You Can't Do That on Television"). Loved this show! I still remember having such a huge crush on David Lascher. Why is it that one of the things I remember most was his character's middle name was Alloicious? I had a Hey Dude birthday party for my 8th birthday (1992). We played pin the tail on the rattlesnake and had cowboy hats and bandanas...it was awesome. I was actually born in 1986 (apparently out of the normal age range) but totally remember this show. I definitely at least remember the tune for the theme song, though I remember all the words to "Salute your Shorts"! I don't know why they bothered to post that age range.... I was born in '86 too and my brother who was born in '88 surely remembers this show as well. I'm actually more surprised about the people who were born much earlier – by the time I was 12-13 we stopped watching nickelodeon for MTV. I liked the Adventures of Pete and Pete. Best. Nickelodeon show. Ever. I loved hey dude and im only 24. It may have only been reruns I watched but in the 90s I watched hey dude all the time. Ahh great memories of good tele gone by! i remember this show as a young girl, i used to watch them on my ma's tele when i would visit her in the states during the summer. You are right Nickelodeon iIS crap today. This was pretty much the only channel I watched all day. David the Gnome, Grimm's Fairy Tale Classics, You can't do that on Television, Welcome Freshman, and the ones you mentioned as well as countless others pretty much guaranteed that there would always be something to watch. In addition after Nick went off, I enjoyed quite a few Nike at Nite shows as well like Dragnet, Get Smart, Green Acres, and Bewitched. wish they stil had that show "wild n crazy kids" that was a good show too! I was born in '85, but still looooved this show! I've been introducing my 3 yr old to this stuff via YouTuve .... She loves Rainbow Brite & Sailor Moon now! Also, the Care Bears Movies (which were my absolute fav) arr her favs too! While I was only born in 1990, my sister remembers it quite well. The reason for the Wild West outbreak of that subsequent time period lies primarily in the media concentration during the fall of Soviet Russia. With a decline in eastern philosophy, the west seemed ready to "expand" in a new manner of Manifest Destiny. At the same time, the start of films featuring a "villain" of Eastern European ethnicity became common (Die Hard anyone?). Interestingly enough American media focuses on the "alien struggle", as evidenced in films like Battlefield:LA and District 9, in a somewhat caricature-istic view of immigration and naturalization. I didn't have cable to get Nickleodeon...but here in Canada I *did* have Neon Rider! That was awesome. Every time I see Christine Taylor in something I think Melody!!! To make your home down on the range. AWESOME!! That was one of my favorite shows as a kid... I still remember all the words to the theme song! Loved this show. I can still remember most of the theme song. Totally had a crush on Christine Taylor. 1989-91? Way to make me feel old.... I loved this show! And every time I see Christine Taylor I know her as Melody, not Marsha, not Ben Stiller's wife, Melody. Great show! Brings back some really good memories from when thaty show was on. Now they need to releasr Salute Your Shorts and some of the other shows from Nickelodeon. Nickelodean was awesome in the 80's! Hey Dude, Roundhouse, Clarissa Explains it All, Salute Your Shorts. I LOVE these showa! I am 31 & would watch these endlessly if they were broadcasted in reruns. Head & shoulders above the nixk shows today with smart mouthed kids & obnoxious behavior. I LOVED THIS SHOW! Born in 82.... just recently I was wondering if Nick would ever release it. I also watched Salute Your Shorts and Wild n' Crazy Kids. "Singin', yippie-tie-yai-yay, like the cowboys say!" Oh, Hey Dude... I loved that show. Of course, I loved all things horses. It was just fun. I wonder what ever happened to Ted? I too, loved this show (born in 81). I lived on a farm with horses and begged my parents to turn it into a ranch like on the show. I loved Salute Your Shorts too. Will def be getting this for my daughter and just might break down and get cable if Nick is going to start playing the good stuff again. I think you could consider the horse shoe the comma. Yessss!!! I'd be way happier if they'd release You Can't Do That On Television first. Born in '81. Was a near-prisoner in my home my first decade alive- the kids on Hey Dude & all the other Nick shows were my only cultural outlet! Miss it. Also, love love loved Fifteen! And Clarissa, of course. Awww, Hey Dude was a good show! Loved Melody lol Ohhh yes Drew, I wanna see em come back with, you can't do that on television! What a CLASSIC! It is so eerie that this is on here! About 2 days ago I was taking a leak when that theme song came to my head. It's a little wild and a little straaaaaange,when you make your home out on the raaaaaange! I love it! Yeah I was in that age group an I remember watching it... But it wasn't a show I really liked.. It was like, "ugh man not this show.. Isint there anything else on?!". I'd then flip through the 36 other channels on cable (huge for back then) and come back disappointed nothing better was on. ahhh salute your shorts, i remember i use to watch that all the time and wonder years lol. those were the days... even punky brewster ahahaha and cant forget all of the seasons of fresh prince of bel air classics lol! Nickelodeon will be showing all the great 90's shows like All That, Clarissa Explains it All, Are You Afraid of the Dark etc. starting July 25th. I know I'll be watching it! Hope you guys will be too! Shut the front door! Are you serious!? Are You Afraid of the Dark!? I freaking loved that show! Oooh how I miss OLD Nickelodeon! Was it anything like Jude? Now that was deep. I was so excited to see this on CNN, especially since a friend a I were just talking about this show and Salute Your Shorts the other day. It's been 20 years but I still remember so many scenes and characters...I actually might buy the DVD. Another cult classic...even if only for those of us who were 8 at the time. Good article. Great show. For the haters: if you didn't like it, chances are you were too young. Melody was cute, but I liked the brunette best (was her name Brad?). Such a good show! Thanks for the article. I'll have to distribute it to all my Hey Dude friends. I know they love it too. I'm still waiting on the often promised but never released "You Can't Do That On Television" DVD set. I loved watching all the shows on Nick TV. Hey Dude and Pete and Pete were my faves! I have episodes on VHS that my mom taped and my son who is 19 now got to enjoy them as well. Looks like mom was ahead of her time! Still have those tapes and VCR. i was born in 1978 & mostly remeber melody & ted. omg, i cant believe theyre putting it on dvd! i cant wait to grab a copy! heeey, dudeee was awesum! THAT was a great show! Rocky road was pretty cool. I used watch the show and enjoyed it. I was born in 1982. So I fit in that age range perfectly. Honestly, even as a kid I hated this show. I sat through it to get to Rugrats. Besides Army of Darkness and Evil Dead II, Bruce Cambell's best work was obviously on the "Jack of All Trades" series. I thought that HEY DUDE referred to a line in Mott The Hoople's ALL TEH YOUNG DUDES!!! "Hey Dude" is coming to DVD?! Looks like I have some shopping to do! BTW-Clarissa Explains it all was completely awesome. What girl didn't think Sam was cute! woohoo! I've always remember fondly of this show from my childhood. Nick should do a marathon of Hey Dude and Salute Your Shorts to celebrate this release. So people can DVR it and not pay for it? "not" good call! Oh, I loved Hey, Dude!! I used to watch it on Nick when I was a kid. I guess I was 9 when it started. I remember Melody and Ted and the crazy theme song. Good times. I will have to look into the DVD set! I was born in early 1987, but I vividly remember Hey Dude! Weird, I had the theme song in my head today... My favorite show was Wild and Crazy Kids! I hated this show, because when it came on that meant that the cartoons were done for the day. I think this show helped ruin nickelodeon. I think you helped ruin nickelodeon. You're alias is Mark Summers and live in a giant ear that's full of peanut butter. You yell "Obstacle Challenge" at casual passers by. Loved Hey Dude! My whole family still sings the theme song every once in a while for a laugh! I'll have to get the DVDs. I loved this show, I really wish we could rewind and bring kids up today on these shows, the ones on nick today are garbage. I agree!!! Loved this show and wish kids nowadays would get a chance to see them! Oh man. I still know every word to the theme song! I can't wait to get it! Born in '85 and I loved this show as well...what happened to Nickelodeon? Hey Dude, You Can't Do that on Television (reruns), Salute Your Shorts, Pete and Pete...all classics. Plus how Rocco's Modern Life was ever cancelled I'll never know. Ugh I hated Hey Dude!! I think I was too young to get the gist of it...now Salute Your Shorts is definitely something I would pay for! OMG I was just talking about this show the other day. I still remember the opening theme song, it still gets stuck in my head to this day! Pete and Pete was also awesome. OMG Pete and Pete was it... Guest appearances by Michael Stipe, Kate Pierson, Iggy Pop. these are on DVD and I watch them all the time. So obscure and so funny! There were so many great series from Nick at that time. I used to take an afternoon break from the public pool to catch Hey Dude, Salute Your Shorts and Welcome Freshmen. Also, A.V. Club.com has some great stories about Pete and Pete. Never thought I'd find out about a release like this on CNN! Fun! I may just have to pick this up... A shame this isn't part of the "Rewind" collection though. Not like there's been a release in the "Rewind" collection anytime in the last five years, or that it really was made up of more than a handful of releases... Still, glad to see these classic Nick shows are making their way out. Fingers crossed we get the third season of "Pete & Pete." What a terrifically written article about one of my fond childhood memories. Thank you! The show Fifteen with Ryan R. Was about as good . It was a poor mans Saved By the Bell. Ryan was not a cute kid . Blah. YES! I watched fifteen as well. Ryan Reynolds was the little nerd Billy. It was a Canadian precursor to DiGrassi, I think. I also watched Hey Dude, but I am in that age range they mentioned and had cable. wow! a "blast from the past"! im DEF buying the dvd! im gonna google the cast but i do remember christine taylor david sumthing! i cant wait! David lascher....He did guest episodes for Blossom I remember too. @ryan–the show where they were punished by holding up buckets of water for hours was salute your shorts. Mr. Ernst never had the backbone to punish his crew. Salute Your Shorts!! Another gem that should be released on DVD!!! These were my two favorite shows as a kid! my fav was denny the native american kid.. Remember the rain dance episode? Terrifically inappropriate. I was Danny's NAU dorm neighor after the Hey Dude days. Boy could that guy drink. I heard he died from drinking too much alcohol... not quite sure exactly from where I heard it, though. He was my favorite too! Danny is alive and well in Tucson, not deceased like the rumor going around. He is a roofer out in the hot Arizona sun. When you make your home out on the range! Where everybody knows your naaame! I loved this show! Seems like country music started becoming more mainstream around that time, too. Garth Brooks was one of the first "crossovers" that I remember. I loved that show as a kid. I recall the punishment being holding buckets of water for hours on end. Haha. I might get this for my son. That's rad you would show your son what you grew up watching man! Hey Dude was a great show, all old school Nickelodean were great and special in their own way. I miss them but luckily I got Nick Rewind for Doug, Hey Arnold and Rugrats! That punishment was on Salute your Shorts, not Hey Dude. The kids on Hey Dude, with the exception of Buddy, were all hired by the ranch to take care of guests. Garth Brooks' album, "Ropin' the Wind", revolutionized the dormant country scene at that time. I could talk all day about country music. But, prior to Garth, Country was going through some uncool years. After that Album, skin tight wranglers and flashy western shirts sold like crazy....country re-entered the mainstream (and hasn't left). To come full circle, I think the writer is correct in saying that certain time frame country and western media became re-surfaced. Essentially, "Ropin" the wind was not just any old country album....even if I'm not a Garth fan, I must admit that. @ Matt – You're talking about that like it's a good thing. nuh uh. i cant remember it. they must of not shown it here in mexico. Just wanted everyone to know that we here at Tanque Verde Ranch at thrilled to read about this! The show was filmed right here on our property, and we have many people call and want to come visit because they remember the show! We would love to be part of any celebration or tie in to this promotion in any way we can, it is a great and memorable part of our history!